10M souls in Saigon and sometimes all you need is one: yourself. I see why a lot of people is traveling alone. It's like falling in love, it's scary as hell, but once you're there it's one of the most beautiful things life can offer. Traveling alone taught me one valuable lesson: How to be happy with myself. Travel is food for my soul. I feel more contented than being alone in another country than being alone in Manila. I won't recommend anyone doing what I did because it lacked planning and it was kind of reckless. But I feel I'm a better person after just my first few hours in Vietnam. I forgot how strict immigrations are, and they ask a lot of questions when you're traveling to another country. You really have to be prepared to answer their questions else you'll have a hard time with them or worse, you might get denied. I didn't even book a hotel and the officer was asking me where I'll stay. Good thing I know someone in Vietnam because of my couchsurfing experience. It was not much trouble, maybe it helped that I picked an officer who I think is nicer than the others. He eventually let me pass after I answered his questions. I just leaped over one obstacle, now onto the next. 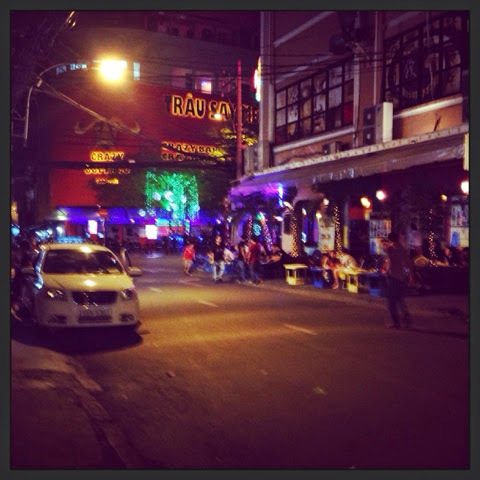 I arrived in Ho Chi Minh around 1am (May 30) and I was totally lost because I don't have a hotel yet. But my biggest worry at the moment was to be ripped off by a taxi driver. I was so lost that I sat outside the airport for 20 minutes to reorganize my thoughts. Fortunately, I saw two Filipino girls (I knew they were Filipinas because they spoke my language when a taxi driver approached them), I immediately went to them and asked them if they are going to district 1. They were friendly enough to offer to share taxi. We went outside airport and get the cheapest taxi, which is 240K dong (around $11). We divide it by 3 so I only paid 80K Dong. I went to their hotel and see if I can book a place their at two in the morning. We arrived. It's strange that the hotel is closed with a steel door like in shops and you have to ring the bell to wake the manager / staff up. Unlike in the Philippines where there's always a receptionist to welcome guests. The girl staff who opened the steel door and she's squinting most likely from suddenly waking up in the middle of the night. I asked if they have a dorm type room but they don't have. The cheapest room they offered is $10 a night and doesn't have an aircon. So I decided even if it's in the middle of the freaking night to not stay and find another place. I bid goodbye to my Filipino acquaintances Aliw and Nica. I am crazy to do this but my gut feeling tells me not to stay in that place. On top of this, the girl staff told me it's very dangerous to walk around saigon at night because there are many bad guys. Ugh. I still went out anyway. So I walk around District 1 with the thought that any time my life can be in danger. I was trying to find Bich Duyen, a hostel I read in lonelyplanet.com with good reviews. I cannot seem to find it and I was walking for 30 minutes already. I asked around but they don't know. 20 minutes more I found it in alley and it's closed! Anxiety is kicking in.. I'm in another country I'm not familiar with, I'm on my own, I don't have internet, it's 3 in the morning and I have no place to stay. All I can think of now is find the cheapest hostel with aircon and stay there for the night. I asked around and they offered around 9-13USD until my 4th try, I saw a nail spa with a sign outside with room rates. I asked the guy staff, Thung, and he said there's dorm type available and it's 5 USD. The dorm room has a capacity of 8 ppl. I took it. The room is decent, aircon works nicely, and the best of all, my 3 dorm mates are all girls. The bed is okay, sheets are clean. I find that the nearest girl in my bed is still up and using her laptop. I just said my little "hi" and didn't bother her because it's too late at night (or too early in the morning, almost 4am); she looks European. I sleep and everything is good. Stress is gone and it feels very good to conquer my fear. So today, I'm on a planned sick leave for the company's annual physical exam and a dentist appointment. I texted my good friend if she'd like to have lunch with me in Eastwood. Coincidentally, another friend of ours didn't have office work so it became a trio lunch meet up! She said if I want CPK or Project Pie. 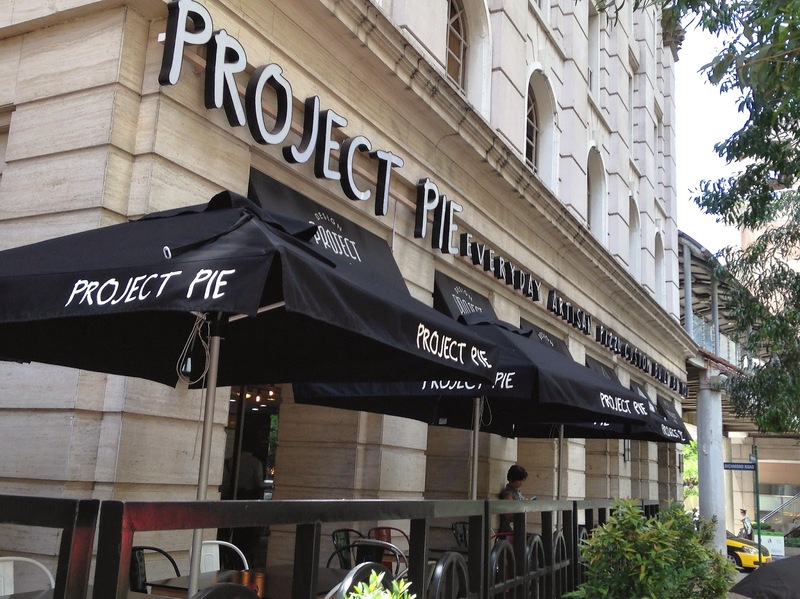 Without second thoughts, I immediately replied Project Pie because I've heard so much about it but I haven't experienced dining in the restaurant. 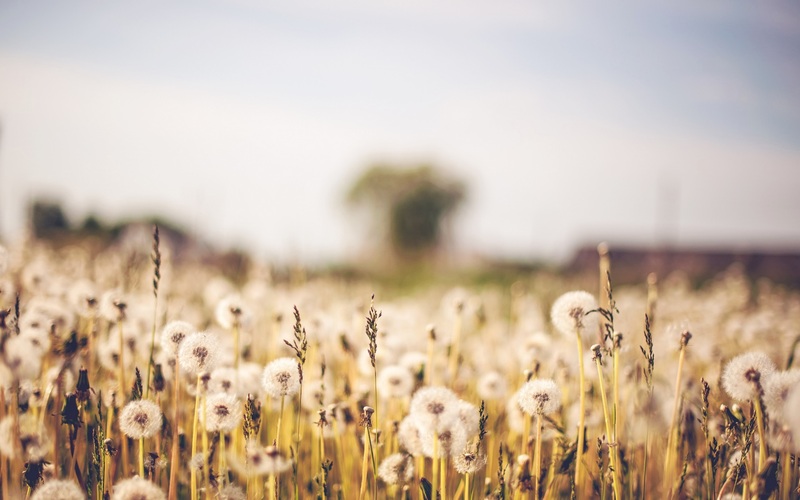 Now, the problem with people telling you something is great (like a movie or a restaurant) is you build this idea up in your head that it's really awesome, and many times you end up being disappointed because it doesn't meet your expectations. Good thing Project Pie did not fail me, but more on that later. The place is normal. Upon entering the restaurant, I was greeted by a large open space with an industrial feel to it. Kinda reminded me of Yellow Cab's design but classier. So yeah, that's that, not much to say about the atmosphere. It's not wow, it's not bad either. It was my first time there so I asked my "veteran" friend to guide me. We started with the menu. It's unusually simple. 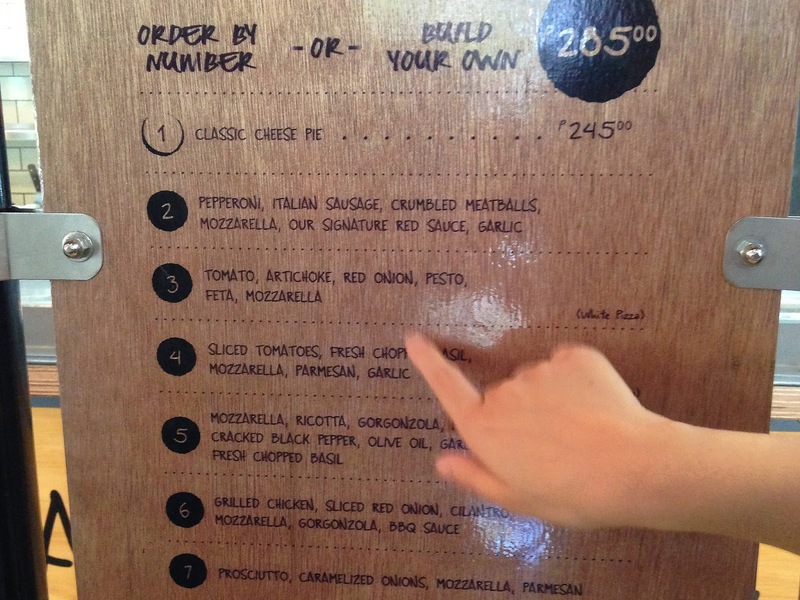 Almost every pizza has the same price (P285). It's beginner friendly also; you'll just pick a number to be your "foundation" then work from there. 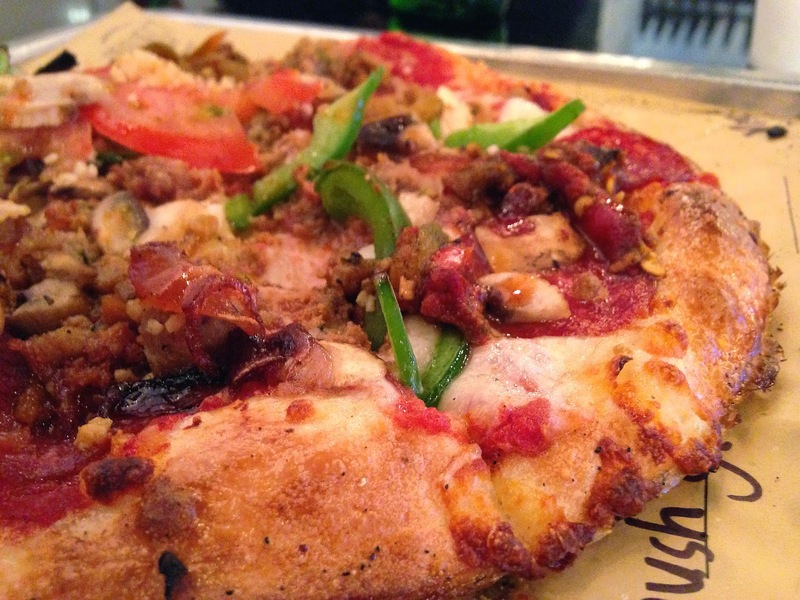 I like meat so I picked #2: Pepperoni, Italian Sausage, Crumbled Meatballs, Mozzarella, etc. My friends ordered #3 and #4. They don't even have a title for each number, just a plain and abstract number. No New York's Finest, Brooklyn's Best or Manager's Choice here, just numbers 1-7! 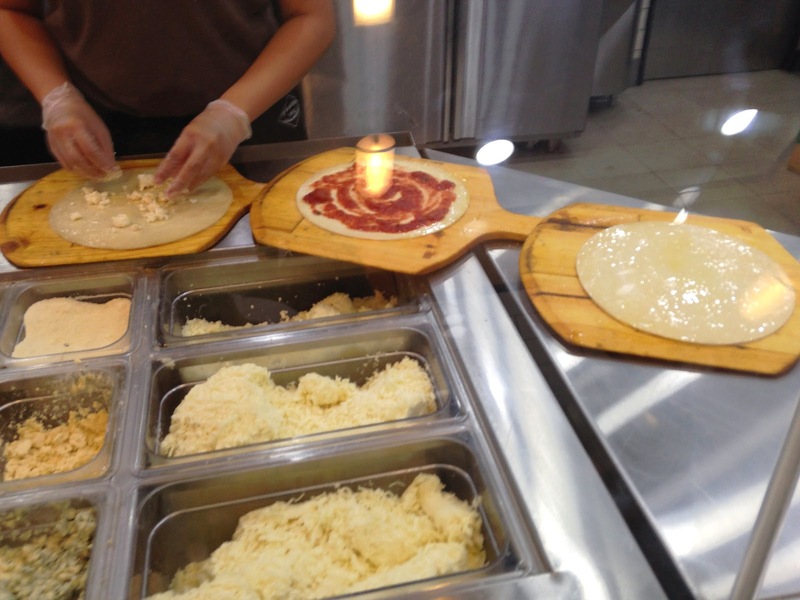 I'd like to divide the process into several stations: The "first station" will ask you for your order, so you'll just say the number (from the menu) and she will prepare the dough. She will then transfer you to the "second station" where you'll say what other toppings you want on your pizza. 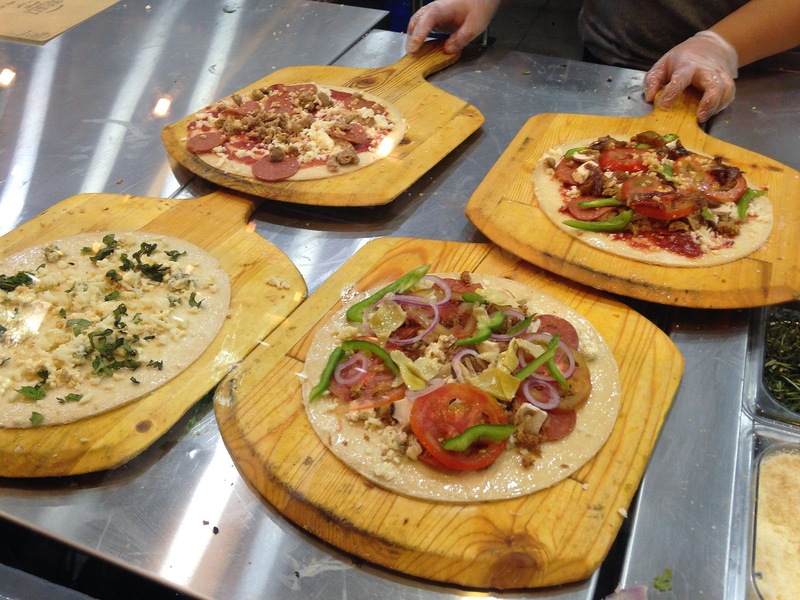 This is probably the most fun and fulfilling part because toppings are UNLIMITED! Yes! It's unlimited, no additional cost, you pay the same amount! I can't reiterate and stress it enough to prove a point, it's UNLIMITED! Whew. I'm okay now. The last station, of course, is payment. It's worth noting that the staff are very well trained. Hands down to the way they handle and talk to customers. They probably have an extensive training like Starbucks, but that's just my guess. I believe that this should be the standard for all establishments, that staff (or stuvvs) should be trained first before they present themselves to customers to avoid unnecessary remarks, impoliteness, and bad customer experience. Kudos to Project Pie for this. Onto the star of the lunch: The Pizza Pie! The buildup was worth it, pizzas arrived relatively fast. The first bite was perfect. I liked the freshness of everything. 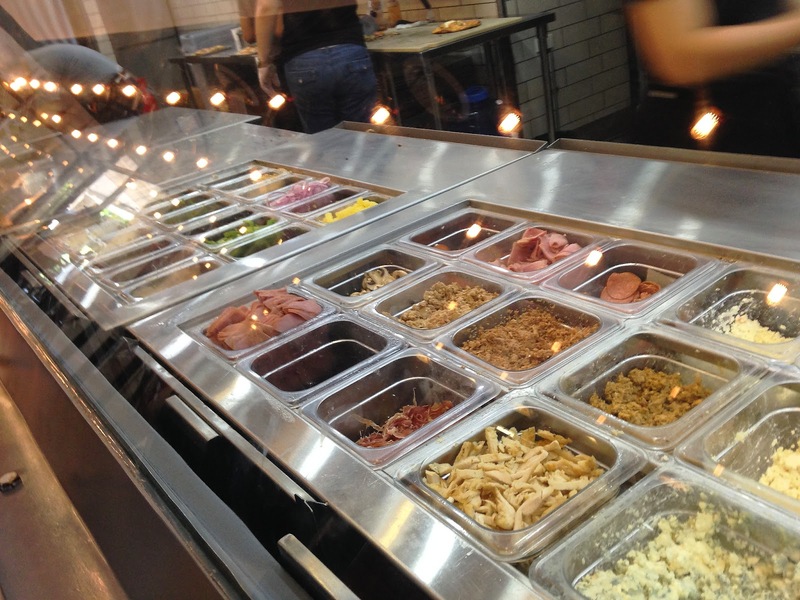 The toppings complemented each other, and I was glad I added tomatoes to my toppings. Without it, it would've tasted too salty because of all the meat. I especially took notice that the crust is very good. I don't know if it's the oven-baked freshness, but I like its texture very much: good balance between crunchiness and softness. On the last minute, my friend and I decided to go for a beer even if it's just one in the afternoon. 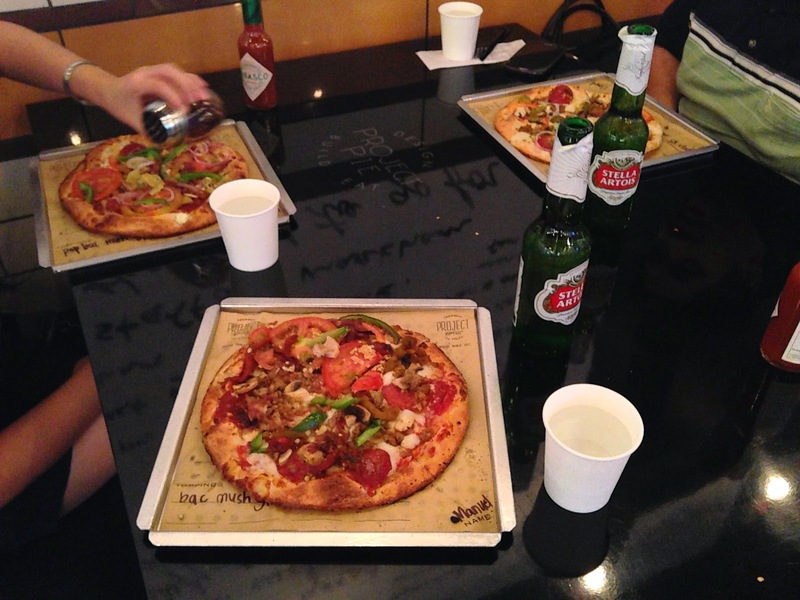 We couldn't resist accompanying a good pizza with a good beer! So yes, we ordered Stella's and it was awesome. I can't say anything bad about the pizza except maybe that the toppings are concentrated on the middle, but it's not much of an issue. 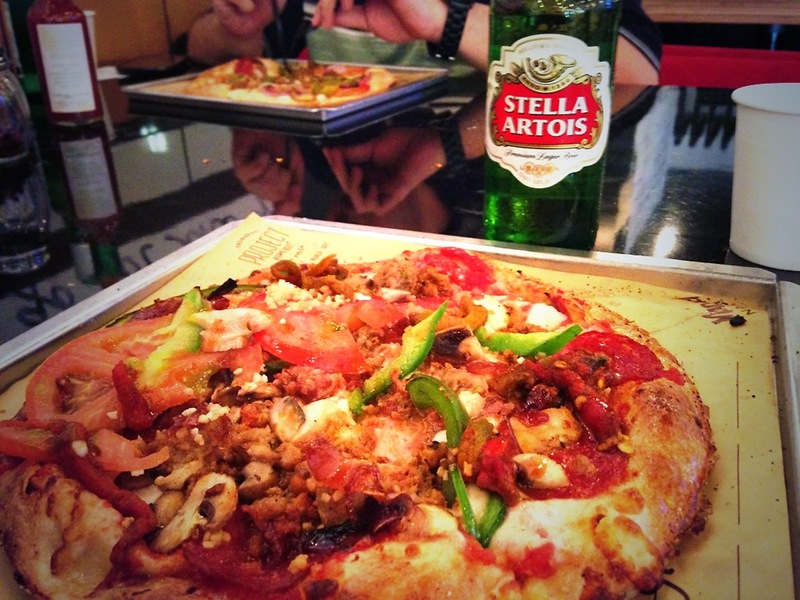 Pizza and beer is the perfect combination! 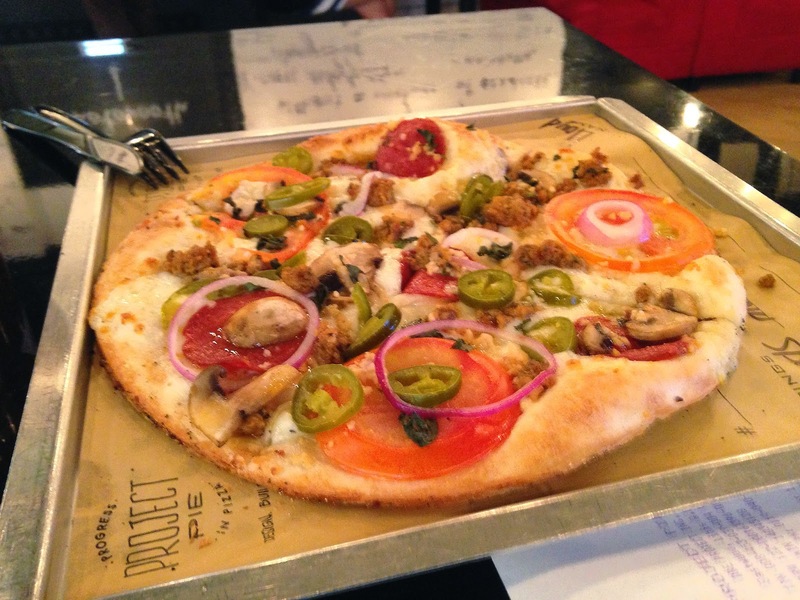 I give Project Pie 4 out of 5 stars! As the saying goes, invest in experience, not in material things. Project Pie provided both! 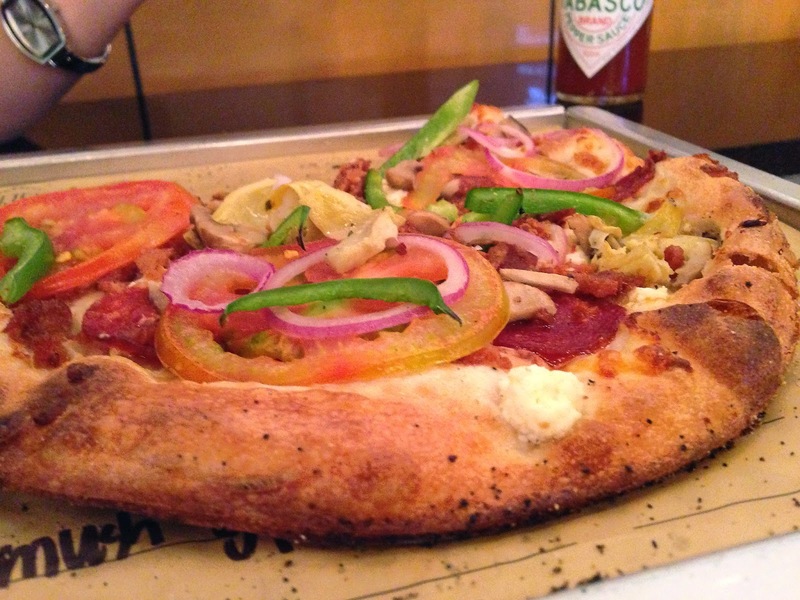 Project Pie stands out from the usual restaurants because they give a slightly different experience. However subtle, they delivered good food and good dining experience. 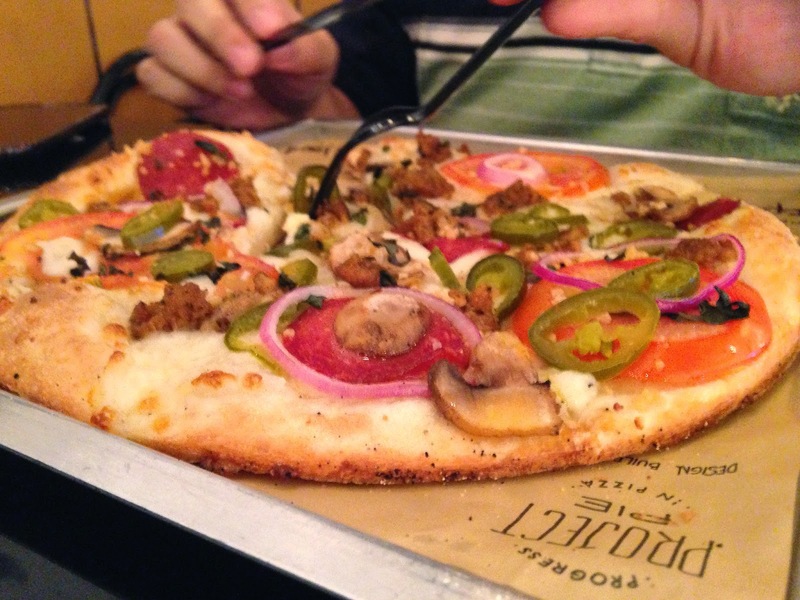 I personally enjoyed my Project Pie experience. 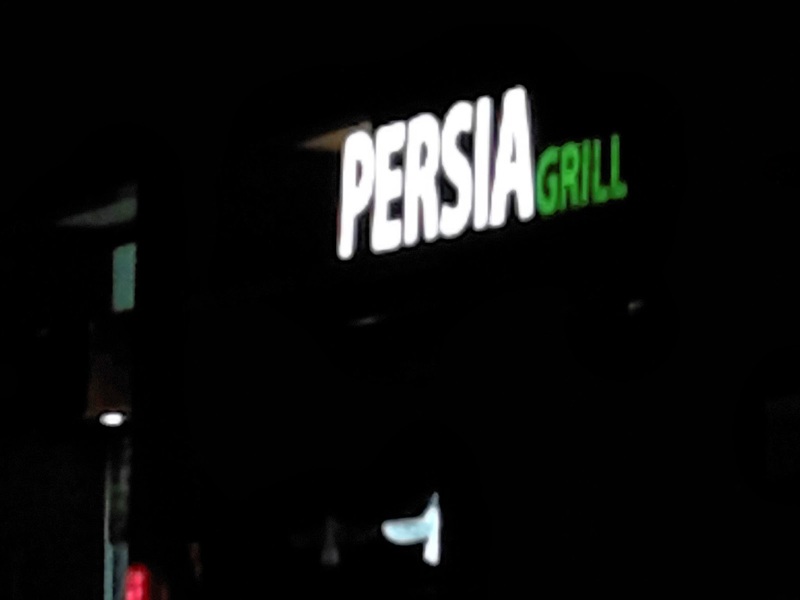 In one of our "boys night out", we decided to eat at Persia Grill in Valero (Makati). It certainly did not disappoint because I tasted a very good lamb dish (but then again, I haven't had much experience on lambs). 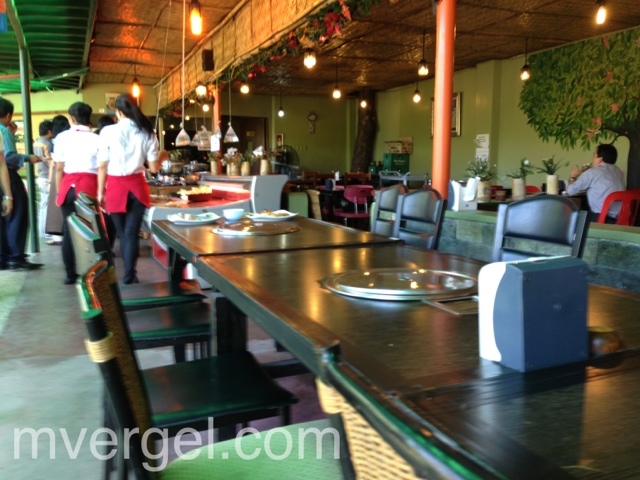 Persia Grill is a casual dining restaurant. 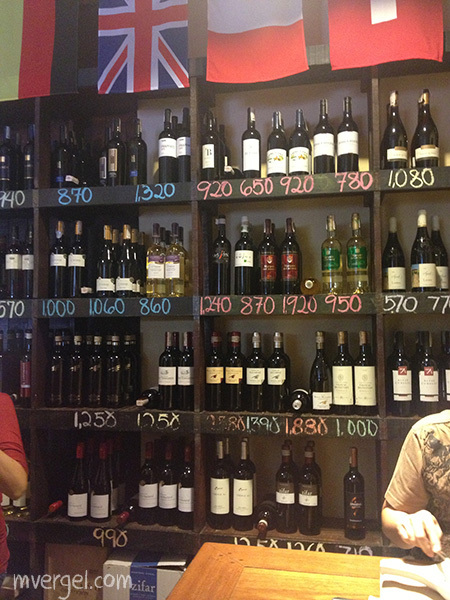 The price average, around P200+ish. I really liked the place. Upon entering the restaurant, I was wowed because I've been to other Persia Grill branches and Valero's by far has the best atmosphere. Lighting is a bit dimmed, ceiling is high, detailed decorations and the place doesn't look cramped. Perfect for dates or conversations with friends. 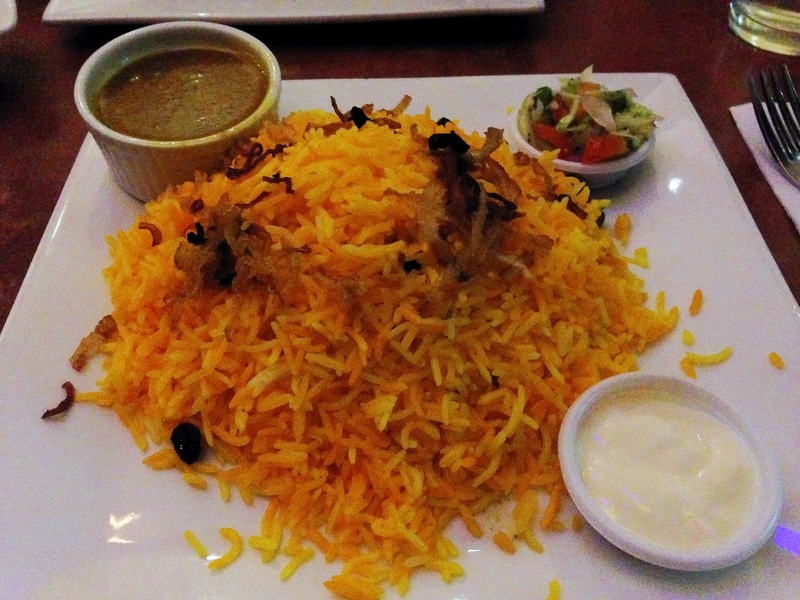 I ordered the Lamb Biryani because it was recommended to me by a friend. I immediately noticed that it's more pricey than the others so it took me an additional second to decide if I'll order it.. and I did! At times I'm a cheapskate but depending on the situation, I'm willing to pay premium for certain things like time, experience, and good food. My order took longer than usual. My friends' orders came out almost immediately (they ordered the usual special chelo kabab); probably because it's easier to prepare than lamb. The wait was tolerable though, after several conversations about women (lol), my food finally came. The presentation definitely needs improvement. It's just like a slab of long-grained rice with a few meat toppings. At first I was disappointed because I thought the topping was all to it but little did I know that there was more to it than meets the eye. 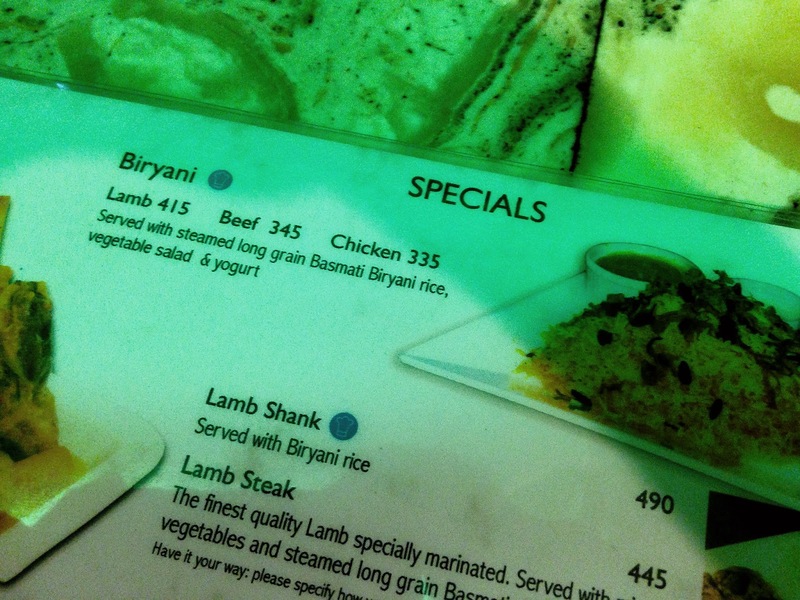 Upon digging in, I was pleasantly surprised to find out that the actual lamb was covered in rice. I quickly took a bite of the lamb cube, and it was scrumptious! It's very tender, there's no "malansa" taste, and it's perfectly seasoned. The sauce also complements the lamb very well. Tip: When you order kabab meals, you can ask the server to create a "burani" sauce. They will just mix the sauces together but somehow it tastes better when they do it. Overall, it was a gratifying experience; from subtle disappointment to the sweet surprise. This is just like real life where one has to experience the bad to appreciate the good! Haha! 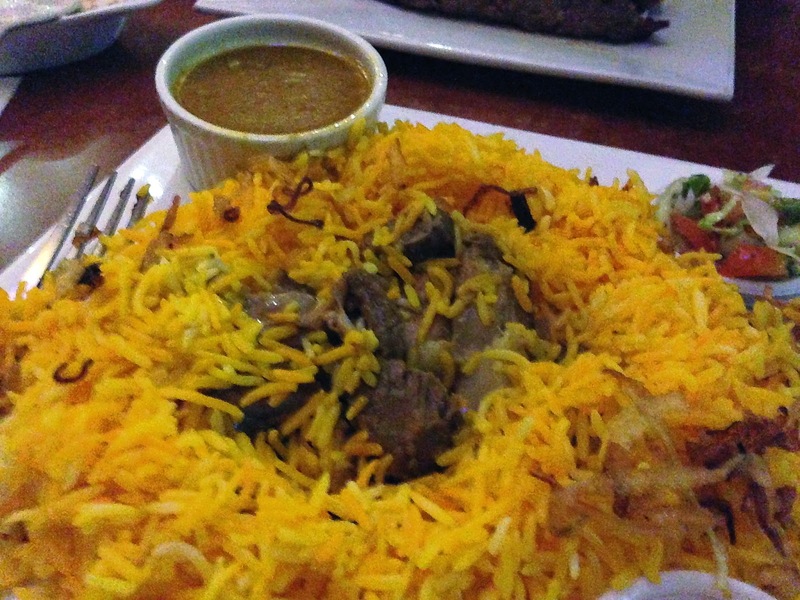 I give Persia Grill's Lamb Biryani 3.5 out of 5 stars. Presentation is lacking, but the most important thing is it tastes good! 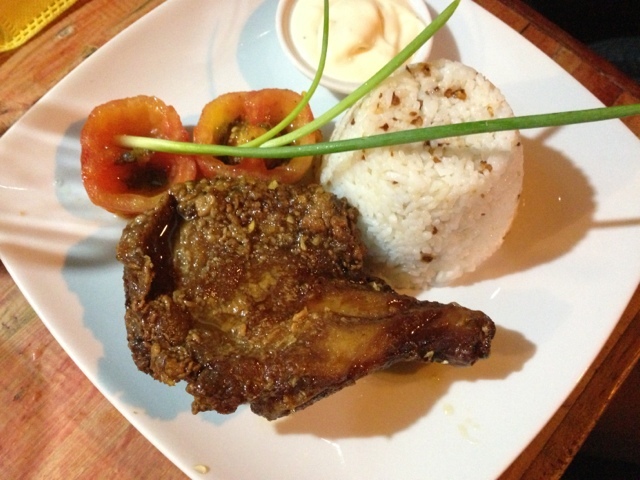 Persia Grill Valero is located at Valero Carpark 2, Valero Street, Salcedo Village, Makati. 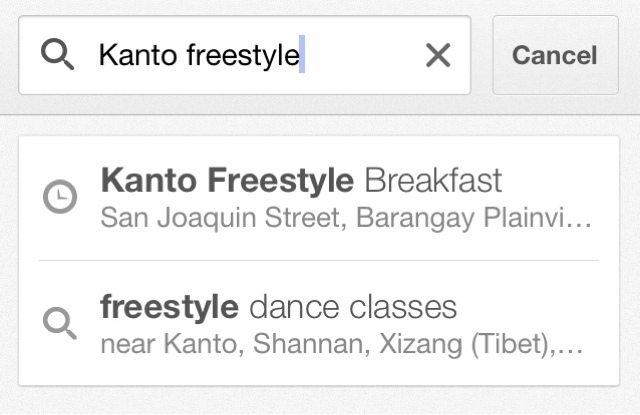 I found out Kanto Freestyle Breakfast on Instagram @kantobfast. Their dishes looked yummy on pictures, I just had to try it out. 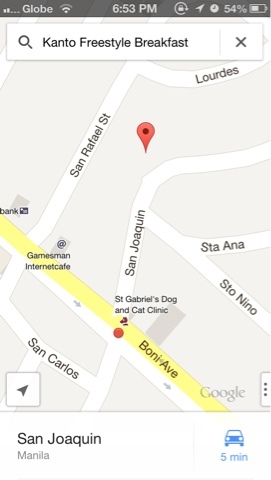 I searched Google Maps app, thankfully it's searchable but unfortunately the location is wrong. Not all people are aware of this eatery but by asking a lot of people we eventually found the place. I pinned the actual location and made a screenshot (it's at the bottom of this page). I was a bit shocked when I saw the place, It wasn't what I expected; it's very small, and resembles more of a turo-turo than a restaurant. At this point, I found myself pre-judging the book by its cover. I was already hungry at this point that I didn't care much what the place looked like. I just wanted to eat good food. We ordered three dishes: Garlic Chicken, Bacon and Egg, and Mixed Berry Pancakes. The orders took so long to finish to the point that even other customers canceled their orders. I don't know what happened in their kitchen but I think they were slumped with the number of orders. Thankfully there was an ihaw-ihaw nearby and we ordered some grilled teynga (pig ears) and hotdog to serve as our "appetizers". But even after we were done eating the appetizers, we waited further more for our actual meal. After the long wait, hurrah! The food has arrived. But was it worth the wait? 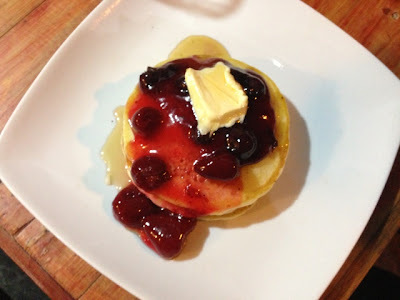 I just love this pancake, it's a little chewy, it's soft, it's sweet, the berries complement the pancakes perfectly, and even the butter tastes better; it's almost perfect. My only gripe is it didn't arrive as hot as I expected it to be; in fact it was a bit cold. Nonetheless, it's one of the better pancakes I've tasted. Hindi nakakasuya / nakakaumay. Definitely worth the P90. Wow, just wow. It's heavenly, the best garlic chicken I have tasted. And again, for P90, it's a steal! I'll definitely come back even just for this. I love the sauce. Just a normal bacon and egg, nothing worth-noting except that the scrambled egg was cooked perfectly. I knew I should've gone for the best seller: Tapa. 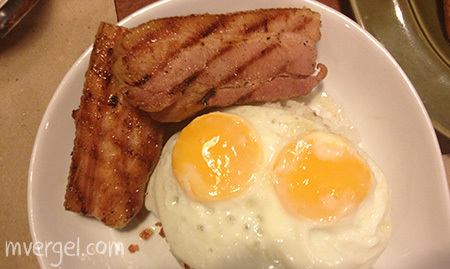 This meal is okay if you're craving for bacon, but there's really nothing special to it. Ahh and one more thing, I'm pretty sure the bread that came with it wasn't a "French Toast". I remember my mother used to cook french toast and it was coated with fried egg and tasted heavenly. I think the one in Kanto Breakfast is just a normal toast. Overall, it was okay. Good ambiance wasn't there though. You'll eat beside the noisy street with tricycles, jeeps and taxis. The tables are small. I was surprised that they were able to fit five people in a small square table, but I find it improper and in the boundary of being rude. There are restaurants that give a homey feeling instead of sophistication, I wish I could say that this is the case for Kanto Breakfast, but it's not. I'm sorry, aside from good food, a pleasant setting is also important to me when eating out. In our case, a customer even brought her dog The dog was barking endlessly while we were eating; it was extremely annoying, I mean come on, why bring a dog to a restaurant, then again, one would argue that it's not a restaurant. You see the problem here? However, the quality and taste of food makes up for the lack of ambiance. 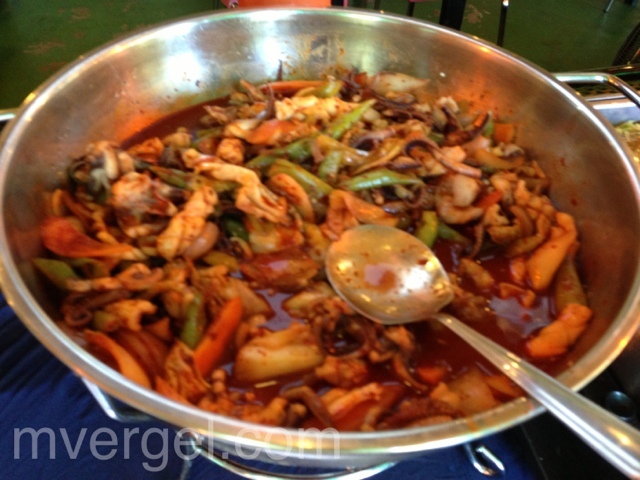 Also the price is very competitive, most of the dishes cost around P90 only. You won't feel cheated in this place and the dishes are cooked to perfection. No problem in the food department, but I wish, I really wish they do something about the place. Heck I'm willing to pay more for that kind of food in a decent place with better service. I feel that they are understaffed. 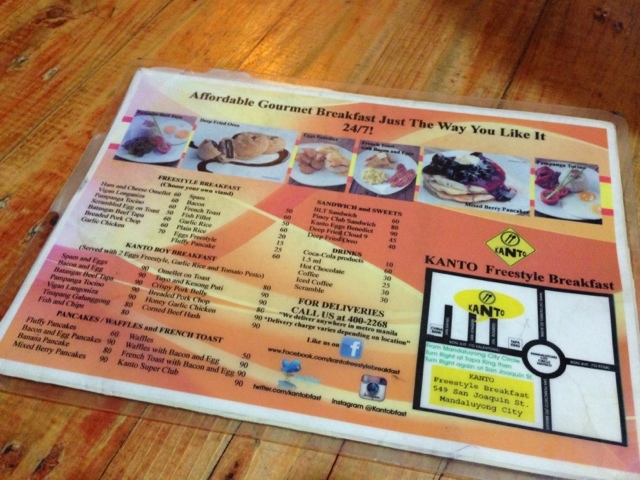 I give Kanto Freestyle Breakfast a 3 out of 5 stars. I would've given it a 4, but the one point loss is for the not so good place. But Google Maps will give you the wrong direction, the pin above is the correct one. Kanto Breakfast Menu. Click to enlarge. 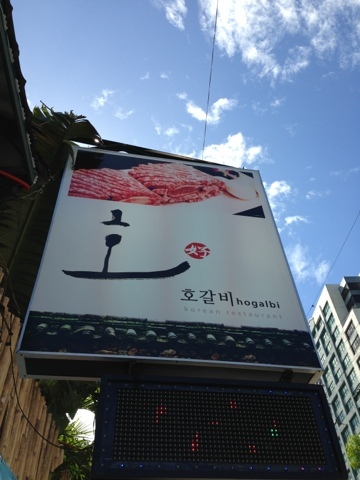 We decided to take a break from the our usual Yedang resto and try something new: Ho Galbi. 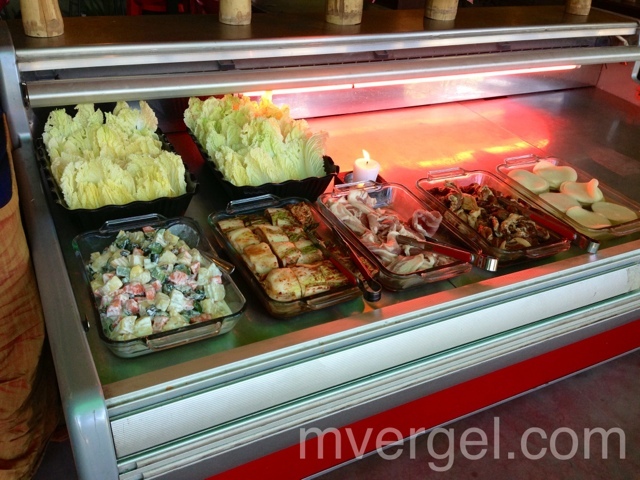 It offers buffet meals at a reasonable cost. 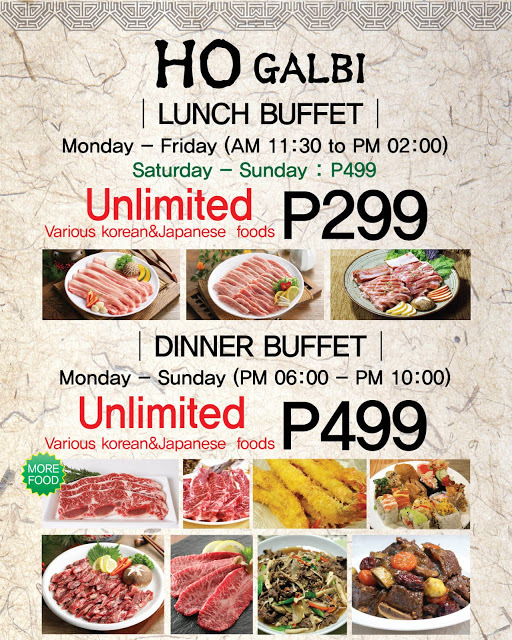 Lunch buffet costs P299 while dinner is at P499. The dinner buffet is more expensive because it offers more food. Upon entering the place, you’ll see a big open space for parking with korean-inspired garden. The actual restaurant is located at the right side of the open space; it gives the illusion of having lunch/dinner at the garden. We only tried the lunch buffet. 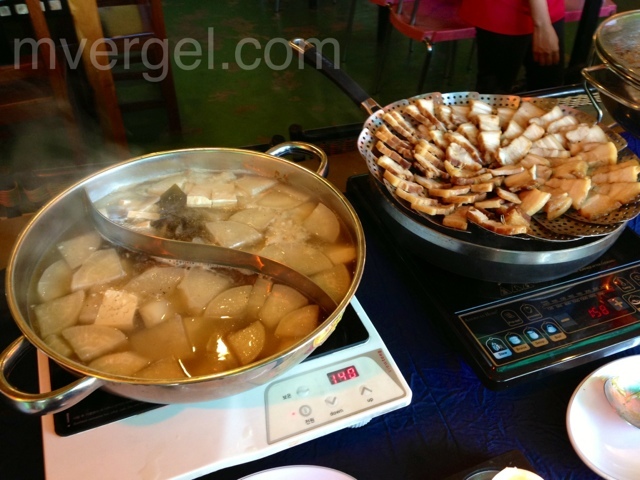 The selection isn’t that great during lunch; you can choose from various pre-cooked dishes, but for grilling, only has fresh pork strips (plain and marinated) are available. But even if there were only few to choose from, the food tasted good! The marinated pork strips were the highlight of my lunch. We just said to the waiter that we were availing the lunch buffet. We got our plates and took whatever’s interesting. 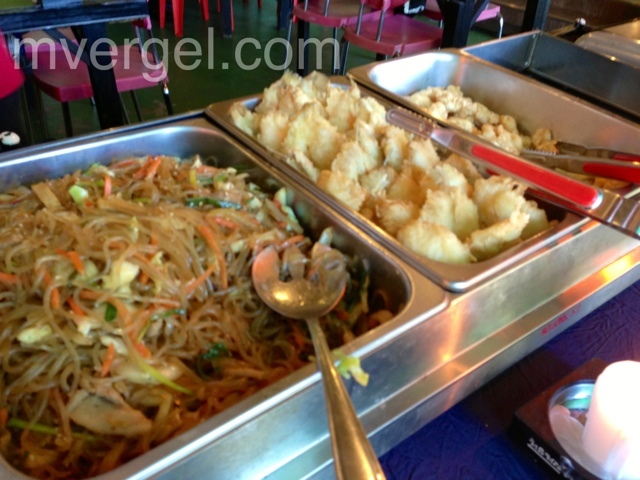 The food selection was not that great, even the side dishes were limited. During lunch, only fresh pork strips (plain and marinated) are available for grilling. But even if there weren’t many choices, the food tasted good. The marinated pork was tender and flavorful. For me, it was the highlight of my lunch and instantly became my favorite. 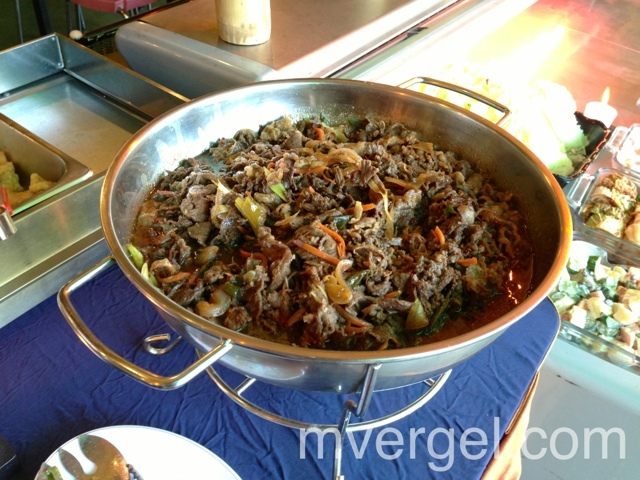 The evening buffet is priced differently at P599, i think the selection here is better and beef is included. But I’m not 100% sure because I’m yet to try it.. 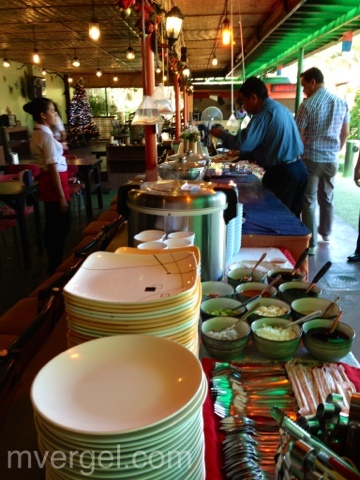 The lunch buffet experience was surprisingly good. Food was seasoned properly, although the fresh plain pork wasn’t salted at all; probably intentional. The place is well ventilated (because it’s open), however there’s no exhaust per grill like in Yedang so the smoke will go wherever the wind takes it and some of your friends will still end up smelling like grilled pork after. Korean food, as always, is best paired with coke. On a minor note, Coke in can costs 40 pesos in Ho Galbi, while Coke 1.5L is 120 pesos. You do the math. Happy eating! In Google Maps, Ho Galbi is named Po Suk Jung Korean BBQ Restaurant. Weird. Once again, we roamed the streets of Kapitolyo to find good food. 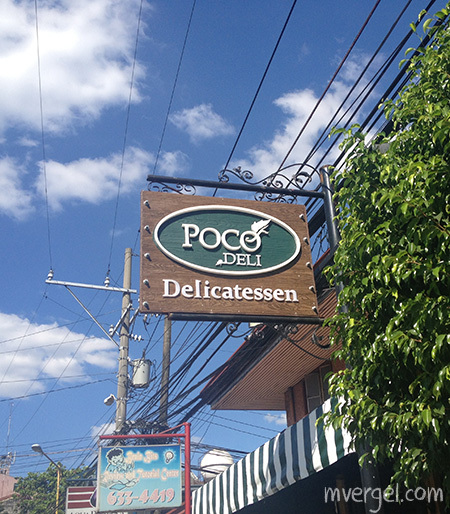 Lo and behold, it's Poco Deli Delicatessen this time. At first we ordered the German Sausage and Cheese Platter but then we saw the German Sausage Sampler and got confused. The description was the same; the price was also the same. The only difference was the other one had cheese in it. Even the first waiter didn't say anything about the difference, he just said that the other one included cheese.. Not helping! We asked another waiter who finally gave a sensible answer. He explained that the German Sausage and Cheese Platter has smaller cuts of sausages. We decided to drop the cheese and go for bigger sausages! The sausage was tasty. If you want a wholesome sausage-fest experience, this must be it (lol). The platter is a choice of three sausages: Kielbasa, Nuemberger, Bratwurst, Cheese Krainer, Chicken Sausage, Bockwurst, Frankfurter, with home made sauerkraut and New York Bagel chips. I forgot what we ordered exactly but I guess anything you order would be good. Although by the time you finish the plate, everything in it will taste the same: salty and oily. Best shared with friends to avoid the umay factor. 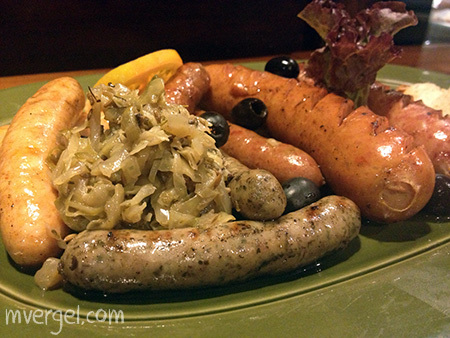 I think the sausage platter is best paired with beer; maybe will try that next time. I ordered the Bacon Slab or Bacon Steak. Got confused again. I think they need to revamp their menu since I got confused twice in one seating. On the picture it said Bacon Steak, but on the list it stated Bacon Slab. Whatever the name is, it's all good. It tasted bacon-y but it was unusually thick; like a lechon kawali. 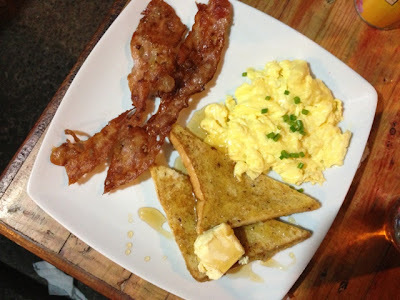 It was accompanied with two eggs and bacon rice, which by the way, was an overkill since I was already eating bacon slabs! On to desserts. 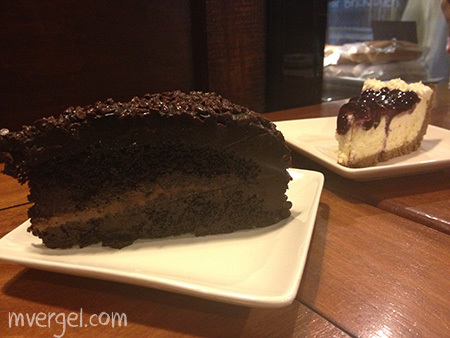 Somehow the less sweet blueberry cheesecake complemented the extra-sweet Blackout Chocolate Cake. Both were delicious, even more I imagine if we ordered coffee. I don't know much about wine except for Pinot Noir from World of Warcraft, but they seem to have a relatively large collection of it for a small restaurant. 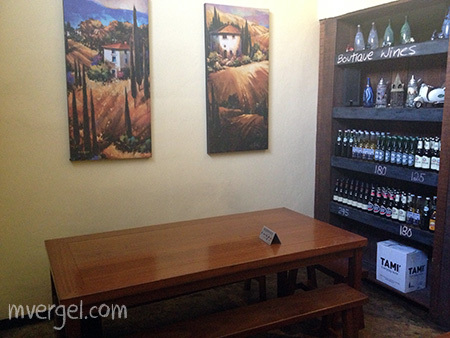 They also have several foreign beers on display which added positively to the overall ambiance of the place. The place was a little larger than Mad Mark's, but still small compared to others. The small space was well-designed and cozy. I would enjoy good conversations over a glass of wine with close friends in this kind of setting. It's a nice place for intimate dates or spending time with close friends. From November 26 (Monday) - 29 (Thursday), pay only half the price when you dine at any TGIF restaurants and use your Citibank credit card. You must have a minimum bill of P2,500.